Compatible with Apple, Android, and PWA (Progressive Web App) platform. Launch day marketing kit is prepared for each school to promote their new app to parents. Ongoing support for the school and all parents well after the launch day has past. Unlimited app downloads, it doesn’t matter how big your school is. Send Unlimited Free notifications to. Our school mobile apps allow parent’s access to the school newsletter directly from their smartphones. This convenience not only increases readership, but also reduces school’s carbon footprint & cost. Parents can now pay fees directly from the school app using their debit/credit cards, in a secure manner. This also helps to avoid late fee and penalties. Integrating your existing Fee Payment Gateway. Our school apps can be easily integrated to your social media page at Facebook, Twitter, Instagram, etc. Our school apps allow parents to book appointment with any school staff digitally using the in-built appointment form. This also helps schools to keep meetings organized and efficient. Sick notes can be submitted by parents directly from our school mobile app, preventing their disappearance in transit. It also saves school administration’s time that was previously spent on paperwork. The School App can be Set-up with secured login. Each school has their own private and secure control panel with secure login to edit content and send pop-up messages. Every school is different. 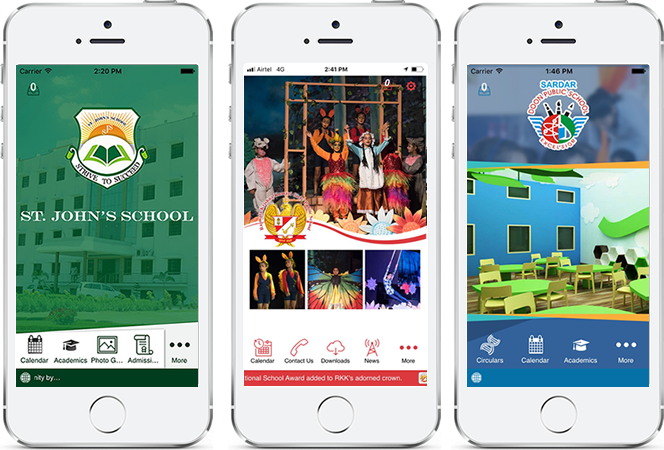 That’s why; our smart school mobile app are customized to meet your requirements. The clear and timely sharing of information between schools and their families is vital for efficient and cohesive education. By improving school to parent communication, our mobile apps (School Apps) have a host of benefits for both parties. Removes the financial and environmental cost of paper newsletters. Notes are communicated securely by school staff to the parent via our mobile app, removing frustrations of notes being returned late or not at all. Provides parents with an easy way to know what is going on. Reduces ‘bad parent days’ by reminding busy parents about upcoming school events. If you are experiencing school to parent communication issues in your school, request a free school mobile app demo and discover the power of this simple, ‘in your pocket’ solution.